Scottish authorities approved Tuesday the development of a vast open pit coal mine in Edinburgh, which would see 10 million tonnes of coal extracted over 10 years, after a report said the project was in the national interest. 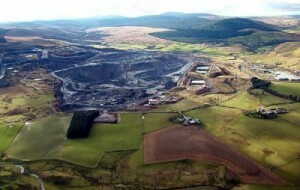 Cauldhall wasn’t just the first new mine to be determined since the collapse of the Scottish coal industry, it was also the biggest mine to be applied for in a long time. But it seems that Midlothian Council still think it’s a good idea despite the fact that the application contravenes the Midlothian Local Plan & Scottish Planning Policy; the fact that a family home will be demolished; the fact that there are no new plans for making sure that Hargreaves don’t do a Scottish Coal and walk away from their responsibilities to restore the site; and of course, the fact that it’s about digging up the dirtiest fossil fuel when even the UN is now saying it should be left in the ground.